The ACE award has allowed AWB to expand the network of people we serve as both members of our organization and disability awareness education within our community. As well as allowed us to include more social opportunities for our performers. Acting Without Boundaries is featured in the October 2016 issue of Backstage Magazine! Read More Here. AWB will perform “Singin’ in the Rain” on October 4th at The Haverford School with their annual after party following the show. The cast is enjoying a rehearsing this upbeat show and looking forward to their 5 day summer workshop in July! On May 17th at 3pm, AWB Jr. will perform “The Dot” in the theatre at the Agnes Irwin School. The Dot is a story of a little girl’s journey of surprise and self-discovery. AWB was a 2014 beneficiary of the annual Community Clothes Charity consignment sale. On May 6, 2014, AWB received the ACE award for Community Excellence from Inglis. Christine Rouse honored by the Please Touch Museum with the Great Friends to Kids Award. Honoring those who make a positive impact in our community, The Please Touch Museum hosted its 17th annual Great Friend to Kids Awards on November 8, 2012. Acting Without Boundaries was featured on CBS Philly. 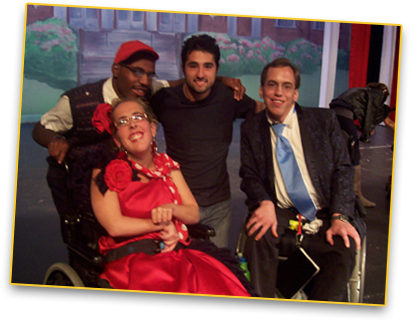 Acting Without Boundaries (AWB) took its show on the road and headed to Philadelphia! On Sunday July 22, 2012, the AWB actors, all children, youth and young adults with physical disabilities, revived Broadway’s Rogers and Hammerstein with AWB Goes Broadway: Some Enchanted Evening at the Arden Theatre in Old City. “To see everyone’s faces at a performance tells the whole story.